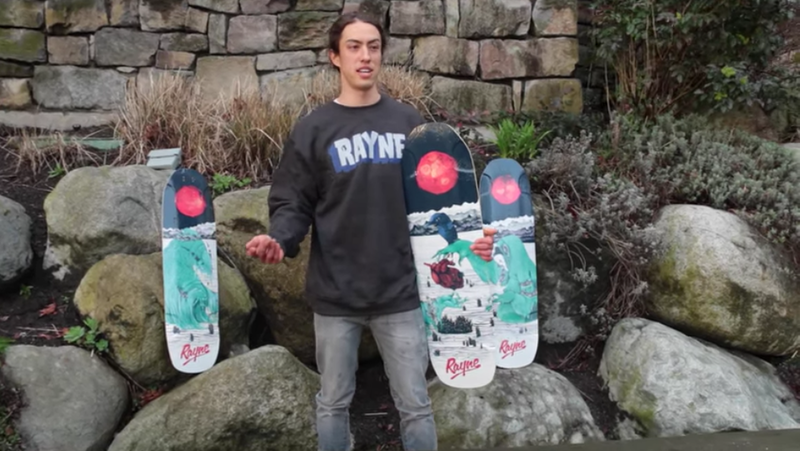 Eric Hoang from Daddies Board Shop interviews Danny Carlson from Thrillstream Media in a review Rayne's freeride longboards - the Darkside Series. The Rayne Darkside series has to be my favorite boards around. It’s one of those boards that fits my style very well. It’s speed stiff, letting me downhill on it. The rocker platform with the micro drops lock me in, giving me the locked in feeling for freeriding. No matter how sideways I’m looking to get, both stand ups and predrifiting, the board just locks me in. And then they top the whole package off with a sweet kicktail for my favorite style of skating, just dicking around. The whole Darkside series features 3 different sizes. The shortest of the three is the bright side, and the longest of them all is the Rayne Otherside. With me being a taller and bigger dude, I am always on the Rayne Otherside. It fits my size and style perfectly. But don’t take my word for it. Check out this video Danny Carlson from Thrillstream.ca did on the Darkside series for Daddies. He’s taken this board all over the world, putting this board to the test in all terrains.